But long before this, the land on which the club now sits played a significant part in the history and developing traditions of Southern California. Throughout the latter half of the 19th century, life in Southern California was dominated by the great ranches and haciendas of our earliest and most important families, and the Hacienda name was given to our golf club in recognition of this way of life. The precise land on which the club is built traces its origins to one such family -- the Sansinena family -- which in many ways was the first family of Hacienda golf. After the death of Jose in 1896, the family sold the property on which the golf course would be built to those who later sold it to Hacienda’s founders. The Sansinena family became Hacienda members, and Jose’s daughter Marian became a club champion. 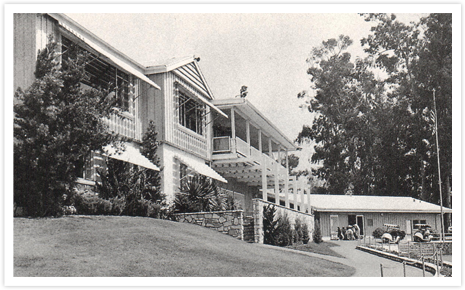 Like many of Southern California’s historic private clubs, Hacienda relied on the passion and energy of its membership for survival during the depression and war years of the 1930s and 1940s. As a result of the creative legal and financial footwork of club icons Fay Lewis and Scotty McGregor, Hacienda survived with enough resources to re-build its clubhouse a decade later in 1955, and undertake a massive renovation of the golf course property in 1964, a then monumental feat of engineering that turned an interesting and distinctive routing into a true championship course. (Left) A.R. "Scotty" McGregor, Hacienda's George Washington. 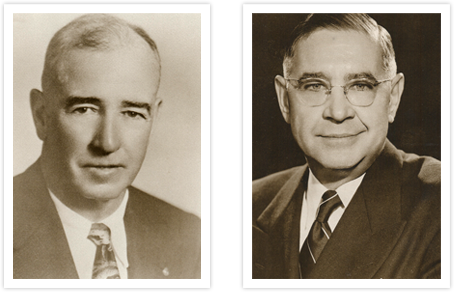 (Right) L.A. "Fay" Lewis, helped save the club in 1943. 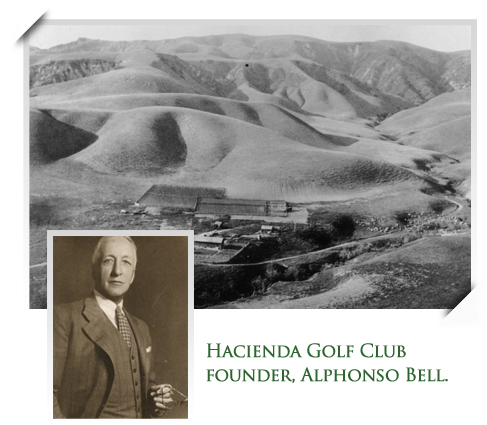 Club founder Alphonso Bell’s family acquired a significant portion of a historic Spanish land grant in the area that is now the City of Bell, and later moved to Whittier where he struck oil and became one of Southern California’s richest and most influential leaders. Along with several of the club’s original founders, Bell created our “jewel of the canyon” within what was first known as the “Rancho La Habra.” What began as one of Southern California’s most exclusive and premier golf clubs, servicing bankers, lawyers and doctors in the Fullerton, Whittier and La Habra areas of North Orange County, has evolved into a club and golf course of such distinction that its current membership is drawn from all five counties in Southern California. Hacienda has a rich history in the world of Southern California golf. It has been the site of countless qualifying tournaments for important amateur and professional events, and has hosted the Southern California Golf Association Amateur Championship three times. Hacienda’s first course record was held by Gene Sarazen, with a score of 70 in 1923. Prior to the recent golf course renovation project, the course record was held by Tiger Woods, who carded a 62 on his way to winning the SCGA Amateur Championship here in 1994. Hacienda is proud that of the five players in the world who have won the career Grand Slam in golf, Hacienda's course record has been held by two of them! 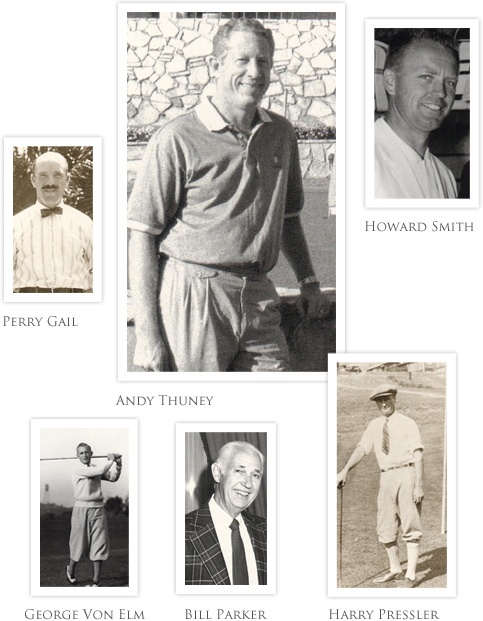 In its history of nearly one hundred years, Hacienda has been the home of several outstanding golf professionals. In addition to its first head professional, Perry Gail, as well as long periods of distinguished service from Harold Pressler, Howard Smith and Bill Parker, Hacienda’s head professional in the 1950s was George Von Elm, one of the greatest amateur golfers of his time. In the 1920s Von Elm won three SCGA Amateur Championships and several national titles. He defeated the great Bobby Jones in route to winning the 1926 United States Amateur Championship at Baltusrol in Springfield, New Jersey, and participated in the longest playoff in the history of the United States Open Championship when in 1931 he lost to Billy Burke after 72 extra holes at the Inverness Club in Toledo, Ohio. Not surprisingly, and despite having played all over the world, Von Elm always considered Hacienda one of the greatest courses he had ever played. Prior to the current head professional, Jonathan Goglia, Hacienda’s head professional was none other than the legendary Andy Thuney. The head pro from 1983 to 2008. Andy served as President of the Southern California PGA for two years in 1986 and 1987, was awarded the honor of SCPGA Pro of the Year in 1988, and has been involved in a series of golf television broadcasts since 1989. Andy’s recent induction into the Southern California Professional Golf Association Hall of Fame was well deserved. In the last few years Hacienda has made a commitment to investing in the future of the club, and as a result, one of Southern California’s most traditional and historic clubs is continuing to reassert its place among the very best of what Southern California has to offer in both championship and member golf.